Concrete laitance is a layer of weak and nondurable cement and fine particles originated from aggregate. These materials are moved upward due to movement of moisture (bleeding) through concrete because of the presence of too much mixing water. 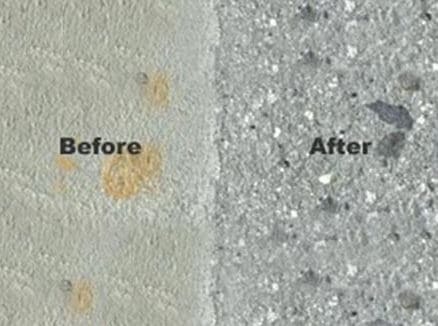 The quantity of cement and fine particles (concrete latiance layer) increases due by overworking or overmanipulating concrete at the surface, by improper finishing or by job traffic. In addition to poor curing of the surface which contribute towards the formation of laitance. So,laitance comes in varying degrees of thickness, from a fine dust to several millimeters or more, based on contributing factors. The removal of laitance is important to ensure that materials applied to the floor such as painting and coating adhere to it adequately. There are several ways to remove laitance and the method chosen should depend on the working environment and purpose of the floor. Shot blasting is assumed to be fast and efficient laitance removal technique. It involves firing abrasive elements on the concrete surface at a high velocity. Moreover, it is estimated that, shot blasting technique clean minimum area of 1000 square meters per single day. Shot blasting is a dry process which is an advantage since floor laying might be continue in other area of the room during shot blasting process. Lastly, it is considered as far quicker, quieter and cleaner than other methods such as mechanical planing, scabbling, etc. Mechanical planning, which is also termed as concrete planing, is utilized to remove greater thickness of concrete laitance. The machine carries rows of rotating tungsten-tipped cutters to provide an excellent removal of laitance. It is a heavy-duty approach which composed of compressed air tools. 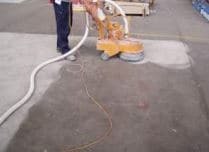 The compressed air tools vibrate and impacts the concrete surface. Scabbling is a slow, very dusty, very noisy and dirty process. This method is used for smaller areas and edges. Handheld grinding machines, designed for precision, control and safe operation to remove concrete laitance. This method is employed for very thin concrete laitance and non-porous or low porous surface. The acid attacks and breaks down the top surface and it is a very effective method. This should only be used if other options have been ruled out. There are a number of approaches like blasting or using abrasive papers for abrading concrete and remove laitance. But their applications are restricted and are not generally used for larger areas. 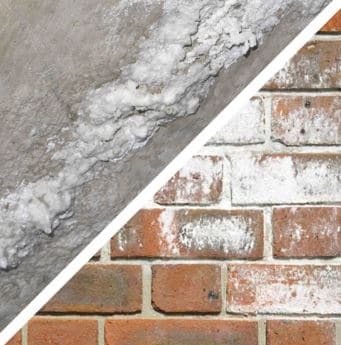 Laitance and efflorescence are totally different, but both are white and powdery materials. the difference between laitance and efflorescence are summarized in Table 1.
laitance is formed when there’s too much water in the concrete mix It is the deposit on concrete surfaces caused by soluble salts in concrete. can be avoided by controlling the amount of water in the concrete mix can be prevented, or minimized, through selecting materials free of harmful salts and by preventing water from penetrating the concrete. Removal methods include Shot Blasting, Mechanical Planing, Scabbling, Grinding, Acid Etching, and Abrading Method Removal technique involves pressurized water, sand ballasting, and chemical acid cleaning. Concrete laitance is a layer of cement and fine particles on surface or concrete? Concrete Laitance and efflorescence are the same? Acid etching is selected for laitance removal when other methods are not applicable? What are the different types of Brick Mortar Joints?